Kwenda Safari has been taking visitors on safaris to Southern Africa and is advising clients on 4x4 self drive safaris since 1998. The company is driven by passion and interest for the wild areas of Africa and sharing these unique areas with visitors to the Southern African region. Our most popular safari option is still the 4x4 self drive safari in our well equipped and very capable Land Rover Defender Safari campers. The self drive safari is reasonable in cost, allows flexibility and is one of the most interesting ways to see 'Africa'. The Land Rover Defender 4x4 vehicles we offer are all fully equipped campers allowing one to live out of the vehicle comfortably for extended periods. Why travelling in a 4x4 vehicle? If you are serious about your African Safari and game viewing and want to experience the best spots of Southern Africa then a 4x4 vehicle is essential. Many of the most scenic areas, finest game reserves and more pristine coastal areas are only accessible by gravel roads or 4x4 tracks. 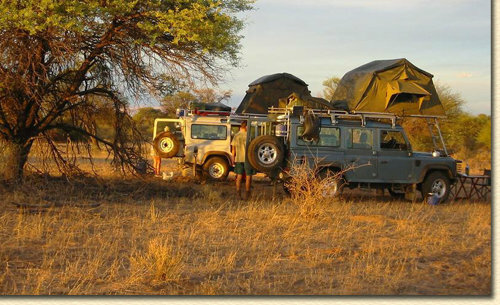 This makes a 4x4 vehicle the ideal mode of transport when exploring the Southern African region. 4x4 vehicles offer rugged reliability and unlimited access to allmost every area. Additional ride height - a 4x4 vehicle is far better for game viewing and many sightings will be missed when travelling in a standard car. Why choosing the Land Rover Defender 4x4 option? The Land Rover Defender is specifically built for over-lander and off road purposes. It is exactly what you want when travelling in the remote areas of Africa - basic, practical and reliable, yet comfortable and of extraordinary capability. All important components like chassis, suspension, engine and drive train are extremely reliable. Practicality: the Land Rover Defender is built for day-to-day hard usage; while to some the square shape may look outdated, it offers excellent load space and good accessibility. Accessories: A large number of accessories unique to the Land Rover are available due to the shape and practical nature of the vehicle. Fitted long range fuel tanks, rugged roof racks, fender protection plates, a front protection bar and a drawer design load system with storage boxes are just a few being fitted by Kwenda Safari to all its Land Rover 4x4 vehicles. Besides, the Land Rover Defender, always being associated to Africa, is definitely the best looking actor on all your pictures when back home and showing your slides to friends and family. For more details and rates on our Land Rovers please visit the Land Rover rental page.